Brake fluid is essential for the operation of the car’s brakes. When you push the brake pedal The brake fluid causes the brake pads to press against the rotors making the car slow down and stop. Over time the brake fluid absorbs air, moisture, sludge and other contaminate and gets contaminated. Air in the brake fluid causes braking to feel spongy and significantly reduces braking efficiency. A brake system flush includes removing the existing fluid and moisture out of the system and replacing it with new clean fluid. A brake fluid flush ensures proper brake system performance and increases the lifespan of your brake system components. Brake fluid service involves the testing and exchange of the liquid contained within the close hydraulic system on a vehicle. The basic purpose of brake fluid is to transfer the movement of the brake pedal through various components or systems to activate the brake pads at the wheels hence, stopping the vehicle. Several conditions can occur that may cause problems with the brake fluid in a vehicle. The most common is a depletion of the additive package of the brake fluid. This can lead to deposits or critical metal brake components, including those that are part of the ABS hydraulic control system. Other conditions can be moisture content and non-brake fluid contamination, such as power steering system fluid. At Canadian super shop. 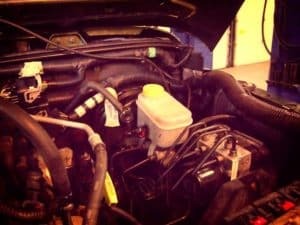 Brake fluid can be quickly and accurately tested in a vehicle simply by removing the master cylinder cover and inserting the end of a brake fluid test strip into the fluid. We then remove the test strip and weighed approximately 60 seconds. The end of the strap will change colour indicating that (PPP) parts per million bracket of copper of the brake fluid in the system. The Copper PPM content of the brake fluid is an accurate and predictable means of determining the condition of the additive package of the brake fluid. By comparing the colour of the end of the test strip to the provided chart, we can accurately determine the PPM of the copper content of the brake fluid and determine if a brake fluid exchange is recommended. The reason we test brake fluid is to determine the condition of the additive package of the fluid. As the additive package is depleted corrosion is usually the result and when the copper content of the brake fluid is over 200 ppm of depletion and corrosion is occurring at an accelerated rate. This is why we test brake fluid, to prevent internal corrosion and other problems such as sludge buildup that can impact the performance of your braking system. It’s all about the additive package contained within the brake fluid that is revealed during testing that determines the need for brake fluid exchange service. Unless petroleum contamination is present fluid should not be judged by its physical appearance. Just because it appears dark for it not as clear as when it was new doesn’t mean that brake fluid replacement service is needed. It is the or depletion of the additive package contained within the fluid that dictates if the brake fluid exchange service is recommended or not the internal components of a brake system include the internal components of the ABS brake system can be affected when the copper content of the brake fluid rises above 200 ppm. What copper content itself doesn’t cause any immediate issues. It is the indicator used to judge the depletion of the additive package. One of the prime purposes of the additive package is to prevent the internal metal parts bracket the part in contact with a brake fluid bracket of the brake system from corrosion. Of particular concern are the sensitive antilock brake system (ABS) components. High levels of corrosion could cause the ABS to fail during an emergency stop. 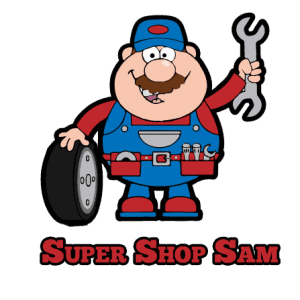 Canadian Super Shop performs a brake fluid flush not simply a brake fluid replacement if any services needed. This assures that the highest percentage of old fluid as possible is removed and replaced with new fresh fluid. The exchange will be performed per the equipment manufacturer’s recommended procedures. 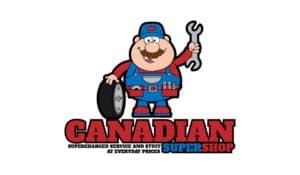 We also retest after a brake fluid exchange services performed and show you their test results as indicated on the test strip get your brake fluid test today at Canadian Super Shop to make sure your brake system is protected.